If you have yet to enjoy the warm, soothing taste of a hot gin toddy, it is a wonderful experience. This is the warm drink that you will be craving all winter long, particularly on those really cold nights. Typically, the hot toddy is thought of as a drink reserved for the dark liquors like brandy, rum, and whiskey, though gin is a fantastic option. It is perfect for sitting by the fire or as an after-dinner sipper and makes a stunning presentation in a snifter or large wine goblet (heat-resistant, of course). The real beauty of the gin toddy is how the botanicals of a great gin like Tanqueray open up when the hot water hits them. It is so aromatic that there is no need for tea in this toddy and it is easy to mix up in just a matter of minutes. Also, the warmth of the botanicals in the gin toddy is an ideal way to soothe a sore throat. If you thought a whiskey toddy was a good "home remedy" for a lingering cold, wait until you take in the aromatics and comforting botanicals of steaming gin. Of course, it will not cure your cold, but it can provide some relief. Build the ingredients in a wine goblet, brandy snifter, or glass mug. Stir well. Garnish with a cinnamon stick. While Tanqueray is the recommended gin for this toddy recipe, almost any gin will work well here. However, traditional London dry gins are preferred because they have that distinct juniper-forward profile. That boldness really is what makes the gin toddy great. If you want a toddy that is even more flavorful, opt for a Navy strength gin or a similar high-proof option. Intense gins like Martin Miller Westbourne Strength and Leopold Bros. Navy Strength will create a toddy you will not soon forget. It's best to treat it like brewing a cup of tea. Be sure that your water is hot, but not boiling. If the water is too hot it can "bruise" the gin's botanicals and ruin an otherwise perfect drink. Your teapot should get it to the perfect temperature or you can heat water for about 30 to 45 seconds in the microwave. 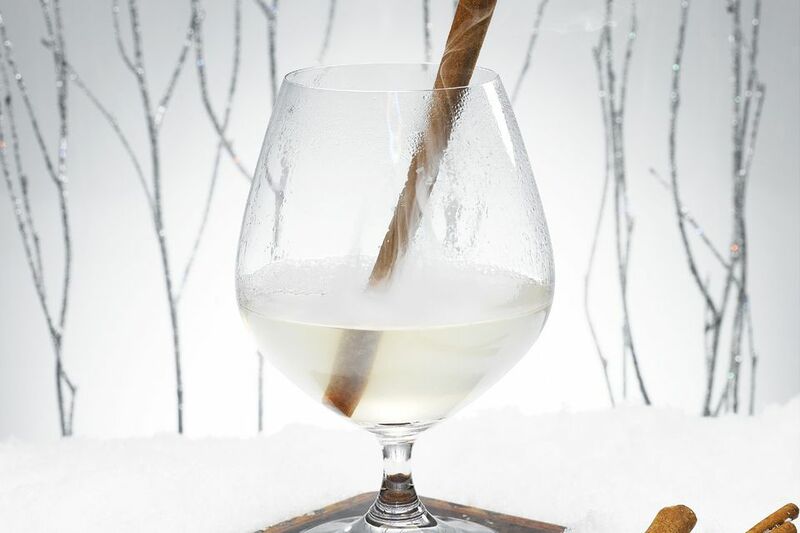 Though garnishes are often optional, consider the cinnamon stick a requirement for the gin toddy. It adds just a little more dimension to the flavor and it doubles as a stir stick to keep everything mixed as you drink. As with any hot toddy, it's best to customize the accent ingredients to suit your personal taste and the liquor you pour. Feel free to adjust both the lemon and sugar as needed. Begin with just a little of each, take a sip, and stir in more if as you see fit. Simple syrup can be used in place of regular granulated sugar. Begin with just a dab because you do not want the drink to become too sweet. Agave nectar and honey are also great sweeteners for any toddy. It's best to use fresh-squeezed juice. This can be as easy as cutting a lemon wedge and squeezing it directly into the warm drink. The prepared lemon juices are okay, and if you do use one, cut it down significantly. Start with just a few dashes, then adjust to taste. How Strong Is a Hot Gin Toddy? If you choose to pour a standard 80 proof gin into your toddy, the drink is comforting, flavorful, and not too strong. Its alcohol content will be right around 14 percent ABV (28 proof), so it's a bit like enjoying a glass of wine.